Home > News > The Surprise Goods Destined for the CSG Shredders! 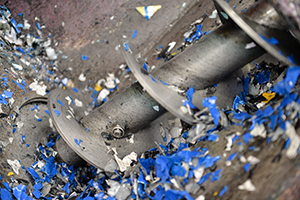 In a security-conscious age, shredding has become an effective weapon of choice for destroying a huge range of confidential or sensitive materials that have to be kept out of the wrong hands. Tons of materials are shredded each day to stop them being gutted for private information, used fraudulently, for health and safety reasons or to prevent them from illegally entering food chains or retail outlets. On the domestic front, an increasing number of householders have added to their facilities by purchasing a home shredder – typically used to destroy anything that might help a villain perpetrate identity fraud. Items such as bank and credit card statements, cheque stubs, utility bills, business letters or any other unwanted document containing personal information are now routinely and safely destroyed. The shredding service provided by CSG goes well beyond the destruction of pieces of paper, and you’d be surprised to hear what’s included among the thousands of tonnes of materials passing through the industrial shredding machines at the company’s waste management plant at Cadishead near Manchester each year. Yes, the company does shred paper – but also out of date products or those that do not meet the correct specification, tobacco and alcohol illegally imported and on sale and seized by government agencies, and products like dangerous hair dyes, hazardous substances and fake pharmaceuticals which could endanger people’s health. Cosmetics and toiletries, washing powders, CDs and tapes, contaminated packaging and confiscated products all find their way to the CSG shredding facility – never to emerge except in secure shredded form! Once they arrive there, it is CSG’s responsibility to ensure their destruction, guarantee that they won’t return to the market place, and whenever possible, recycle the resulting waste. It can be a daunting task for any business to ensure the secure destruction of confidential or business sensitive materials so it makes sense to hand it over for processing to a company like CSG which has the facilities to handle the job quickly and to recognised industry standards. But some customers feel apprehensive about leaving it to a third party and prefer to be present personally to witness materials being destroyed. CSG understands this, and makes a point of welcoming representatives from any customer company asking to observe how their information or goods are put out of harm’s way. And to make sure, CSG can issue a certificate of destruction at the end of each shredding confirming that the job has been completed by a fully authorised waste management company with the credentials to carry out this specialist task. Want to know more about the CSG’s secure shredding service? Contact us on 0800 048 0622 or email technicalsales@csg.co.uk.